The Magical view from Hotel Dubrovnik Palace! If you only have 24 hours here, you need to make them count. 8am: Arrive at Dubrovnik airport. The stunning mountain location bathed in morning sunlight is a perfect introduction to the beauty of this region. 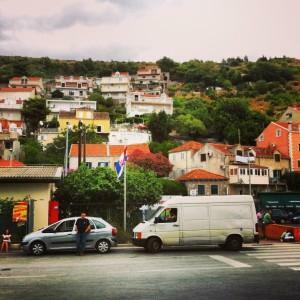 Take a bus or taxi to Dubrovnik town. Sit back and enjoy the view during this spectacular half-hour journey as you twist along the cliff road high above the Adriatic Sea. 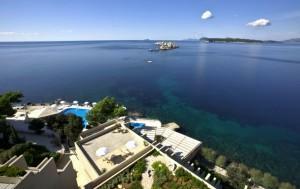 Of all the 5 star hotels in Dubrovnik, the Hotel Dubrovnik Palace has it all. Situated on the Lapad peninsula a short bus or taxi ride from the Old Town, the hotel sits between dense pine forest and crystal-clear waters with a gorgeous view over the Elaphite islands. Check in, soak up the elegance of your surroundings, enjoy an invigorating dip in the outdoor pool, then head into town. 10.30am: The summit of Mount Srdj, which looks across the Old Town to the sea and behind to the mountains of Herzegovina, is the ideal place to get your bearings. Zip to the top in the communist-era cable car in just three minutes and take in the view. Next, to the Old Town. Enter via the impressive Pile Gate, which leads to Stradum, the main boulevard. Enjoy the absence of traffic as you wander along, exploring the intriguing alleyways and lanes that branch off, lined with cafés, shops, restaurants, and museums. Enjoy a refreshing ice cream from one of the ice creams parlours as you wander along, until you reach the harbor. Lunch: With just 24 hours to spend in Dubrovnik you won’t want to linger over lunch. Just outside the city walls is Gusta Me where you can have a light lunch overlooking the harbor. If you prefer, you can assemble a picnic from the daily market in Gunduliceva Poljana square. Afternoon: Indulge in a little culture, by exploring some of the many landmarks or museums dotted around the Old Town. Take your pick from the Sponza Palace, a Gothic Renaissance building, the Dominican monastery near the Ploce Gate, the War Photo Gallery – a sobering reminder of the War of Independence – or the Church of St Blaze, the patron saint of Dubrovnik. Late afternoon, when the heat of the day has abated, take a walk around the city walls – a highlight of any trip. Enjoy views over the terracotta roofs and church steeples, and down across the squares and courtyards. Break up your walk with refreshments in the handily placed cafés as you look out to sea. Evening: Head back to your room to spruce up for dinner, and enjoy a quick sundowner in the Sunset Bar – surely the best view of all the hotels in Croatia – before heading back to town for a little Al Fresco dining with the locals. There are many restaurants around the Gunduliceva Poljana square, where you can enjoy traditional Croatian food, including the popular Kamenice. Round off your evening with a drink at Buza, or visit Lazareti, an independent culture center with various theatre, music or arts events. Finally, return to the Hotel Dubrovnik Palace for a good night’s sleep.